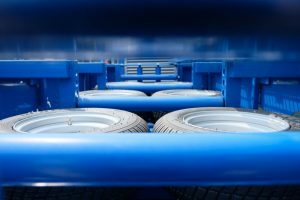 For handling of cables during transport and laying, Hulst Innovation Cable Equipment (HICE) has gained years of experience developing suitable equipment and solutions. 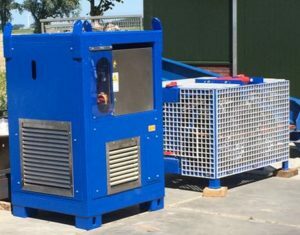 Developed and built equipment, like the Linear Cable Engine (LCE), the Bow Cable Engine (BCE) and various loading arms, are in use to full satisfaction with clients in- and outside Europe. Both LCE and BCE can be built with certification by GL-DNV (Germanische Lloyd – Det Norske Veritas). The main use for a LCE is on board an installation vessel for laying (power) cables on the seabed and therefor has a capacity of 5t. pull force. This higher pulling force is transferred to the cable by means of five (5) hydraulically driven wheel-pairs. The HICE arrangement of these wheel-pairs enables a compact lay-out of the machine whilst ensuring equal distribution of forces on the cable. In case pulling forces higher than the capacity of the LCE are required, two or more LCE’s can be placed in-line, allowing pulling forces up to 10 or 15t. The LCE control and hydraulic systems are incorporating this option as standard. Since 2007, HICE has delivered six (6) LCEs with various options, however always based around the 5t. base-machine which has proven to be a flexible and reliable machine on many projects. The Bow Cable Engine (BCE) was developed specifically by HICE and is one-of-a-kind. The operating principles are similar to a LCE, however the BCE is mainly used during cable loading (shore-vessel) and transpooling operations. 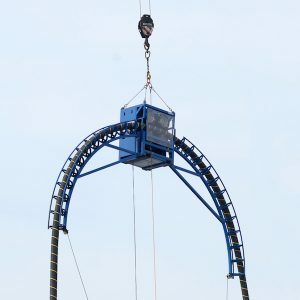 The BCE is lifted by a crane and pulls the cable from the (temporary) storage facility, cable coil or turntable, and feeds the cable in the direction of the vessel. Since this requires limited pulling forces a two wheel-pair solution with a capacity of 2t. is sufficient. As a result of this the BCE has a compact shape en relatively low weight, which are both favorable for transport, lifting and operations. The BCE has been built to meet client requirements since 2006 and a total of twelve (12) BCEs have been delivered to the satisfaction of various clients. For loading of cable(s) in a ‘static’ cable tank a BCE can be utilized. 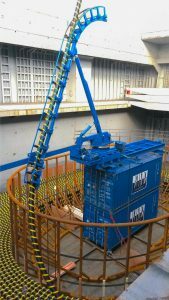 Since the BCE is typically lifted to approximately 25m above, the cable can be coiled into the cable tank. Depending the size and diameter of the cable tank, the cable is positioned in the tank by stevedores or a cable loading/guiding system. 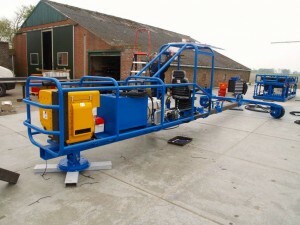 For these loading/guiding systems HICE has built several solutions like the ‘loading scooter’ and various loading-arms. 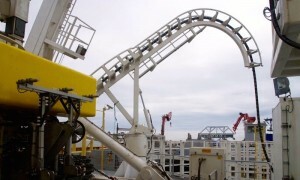 The loading scooter guides the cable to the right location using a hydraulic slider fitted with rollers. 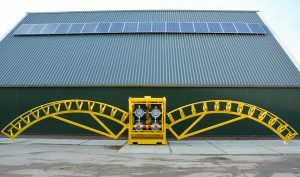 The hydraulically powered wheels rive on top of the outer wall of the cable tank (hence named ‘scooter’), whilst the whole machine pivots around a bearing point in the center of the cable tank. 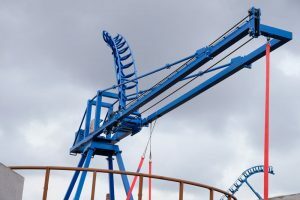 The various loading-arm systems basically function in the same way. The major difference is their central placement in the centre of the cable tank and not using the outer wall of the cable tank as support. An specific example of a HICE-solution is the oval coiling arm, which by means of an ingenious system allows to guide the cable in to an oval cable tank. 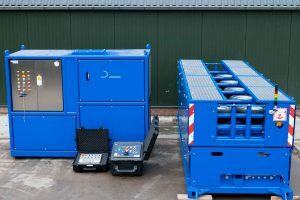 In both cases the loading arm systems are fitted with HICE-design roller-boxes, equipped with 2, 3, or 4 rollers of the required size, to ensure ample support of the cable and terminating extreme bending or external damage to the cable during handling/loading.